The 47" gold and white Collapsible Reflector from Profoto provides the ability to bounce and shape sunlight and studio lights to place light where you need it and improve the overall light quality on a subject. The gold side of the reflector creates a warmer light with a higher color temperature, while the white side offers a reflection of natural light. The reflectors feature two ergonomically shaped handles for added comfort and better directional control. Sturdy fabrics and a strong, yet easily folded frame help provide long-lasting durability. Box Dimensions (LxWxH) 17.9 x 14.4 x 1.9"
Collapsible Reflector - Gold/White - 47" is rated 4.5 out of 5 by 19. Rated 3 out of 5 by Stormy the Ninja from Good quality, but white isn't reflective I received both the Black/White and White/Sunsilver reflectors today. Both are very high quality and robust, but the white side of the Black/White reflector is very different than the surface of the other one: it's a matte, non-reflective white. it's about the same color, per se, but will absorb about a stop of light, instead of reflecting it. Pretty good for shoving behind a subject to give them a clean white background in a snap at the end of an environmental portrait session, but I can't really do butterfly lighting with these two reflectors since they are so different from one another. Just a heads up! Rated 5 out of 5 by Michael C. from High Quality Reflector After buying, using, and relegating to the studio closet, I found the Profoto collapsible reflector and I'm sold!! Easy to fold and works as a great light shaper. Quality stitching and construction means long life. Wouldn't be without the several I own!! Rated 5 out of 5 by Trav the photographer luver from Make Photographers Jealous The problem all photographers have with reflectors are there longevity. But you will not have that problem with this reflector. It is really sturdy. I have used it as a fill light while shooting headshots and the handles are perfect for my assistants to hold just at the right angle when I need to shoot portraits and capture the natural light perfectly. I have absolutely no complaints about this reflector other than I wish it was a 5 in 1. But this is Profoto and if you want the best you have to pay a little extra. Rated 5 out of 5 by Dan from Profoto Collapsible reflector Beyond just well made! This reflector has a rigid enough frame to keep reflector working better under many conditions. silver side works very well and is a strong source with hard light though it can gather soft light well too. my only change would be to have a smaller Black edge especially on the white side, the black can show up in reflections. I have this for in studio and outside and it is the best reflector I own. Rated 5 out of 5 by John from The Handles Make The Difference The two handles make it easier to handle in outdoor, windy conditions. Rated 5 out of 5 by Maureen N. from Best diffuser I've ever used This diffuser is fantastic -- significantly more stable than the Lastolite models of similar size that I have used for years. 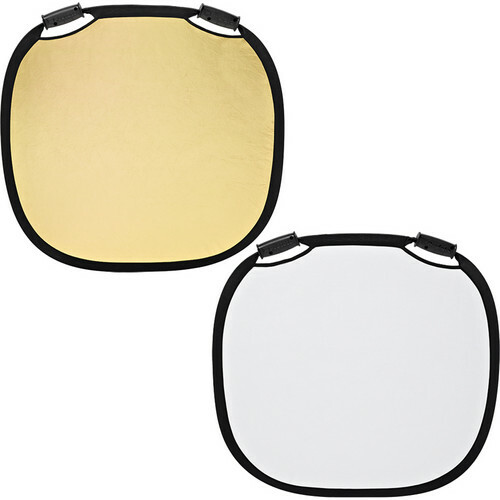 The Profoto translucent reflector is much easier to handle with its stiffer frame and two handles. The large size is ideal for better coverage. The price is higher than other brands, but totally worth it. Profoto really is the best and it shows in the construction. Rated 5 out of 5 by Bill D from Great quality The quality of this reflector is outstanding. Deep black/ bright white reflector. When diffusing the sun or other light source, how much does it absorb? One stop? More? This product would reduce the light by 1 full stop. How much light does this cut down when used as a diffuser? One stop? A stop and a half? This product would reduce the light by one full stop. Easiest way is to grab diagonally across a corner in the middle of the straight sections, with the handles next to and across from you. I drop it down and as I pull it up I Twist your 2 hands toward each other folding both edges down as they come together and it should fold into thirds. once you do it a couple times you won't evan think about it as you do it. On the black &amp; white versions, is the black and white side completely opaque and is the white a pure white, unaffected by the black behind it? The white is unaffected by the black. The white is a solid piece of fabric that is very reflective.